Later today Chelsea will take on Manchester City in what will be, so far, the biggest match of the season. Currently Chelsea are 5 points clear of Man City, who are their closest rivals at the top of the English Premiership. If Chelsea can win at home today they will go 8 points clear, but if they lose the lead will be cut to only 2 points. Chelsea go into the game after a shock defeat last weekend in the FA Cup at home to lowly Bradford City, a game they lost 4-2 making it their heaviest defeat at home under Jose Mourinho. A fortnight ago they thrashed Swansea City 5-0 away, and they have also had two mid-week games against Liverpool in the semifinals of the League Cup, drawing the away leg 1-1 and winning the home leg 1-0. Manchester City go into the game playing their first match since their shock FA Cup defeat last weekend to Middlesborough 2-0 and their home defeat to Arsenal 2-0 the weekend before. 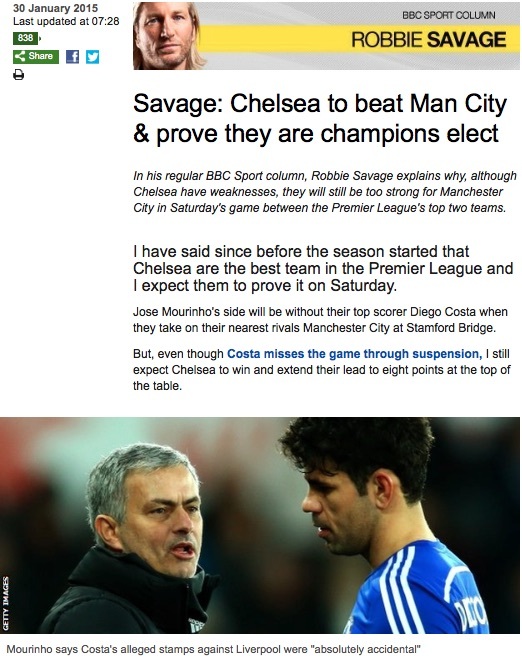 So, on paper, Chelsea should be the more confident side with a better recent record. But, today’s game will probably mostly be about who can handle the pressure the better – with such importance riding on the game. In this respect I expect Chelsea to come out on top, as Mourinho is the master tactician and sides he coaches usually can handle the big occasions masterfully. But, we will know later today – kick off is at 17:30 GMT. As it is 46 years ago today that the Beatles last performed live in front of an audience in their famous “rooftop concert” on top of their Apple building in London, I thought I would reblog this – their rooftop performance of “Get Back”. Enjoy! Just time for a VERY quick post today. 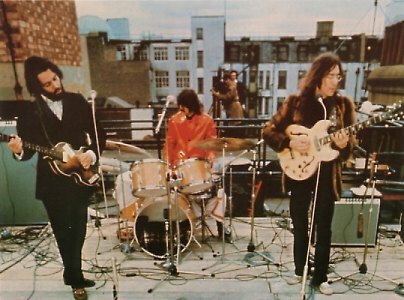 A wonderful performance of Get Back, live on the rooftop of the Beatles’ Apple headquarters in Saville Row, London in January 1969. The Beatles during their impromptu rooftop performance, in January 1969. Very interesting update on the BICEP2 primordial gravitational waves story. The results of their collaboration with Planck will be officially released next week. I think it’s time to break the worst-kept secret in cosmology, concerning the claimed detection of primordial gravitational waves by the BICEP2 collaboration that caused so much excitement last year; see this blog, passim. If you recall, the biggest uncertainty in this result derived from the fact that it was made at a single frequency, 150 GHz, so it was impossible to determine the spectrum of the signal. Since dust in our own galaxy emits polarized light in the far-infrared there was no direct evidence to refute the possibility that this is what BICEP2 had detected. The indirect arguments presented by the BICEP2 team (that there should be very little dust emission in the region of the sky they studied) were challenged, but the need for further measurements was clear. At number 89 in BBC Radio 2’s 100 greatest guitar riffs is “C’mon Everybody” by Eddie Cochran. This song was released in October 1958 and got to number 6 in the Disunited Kingdom singles charts, and to number 35 in the US. Cochran sadly died in England in 1960 in a car crash at the age of only 21 whilst on tour; most of his songs were released after his death. 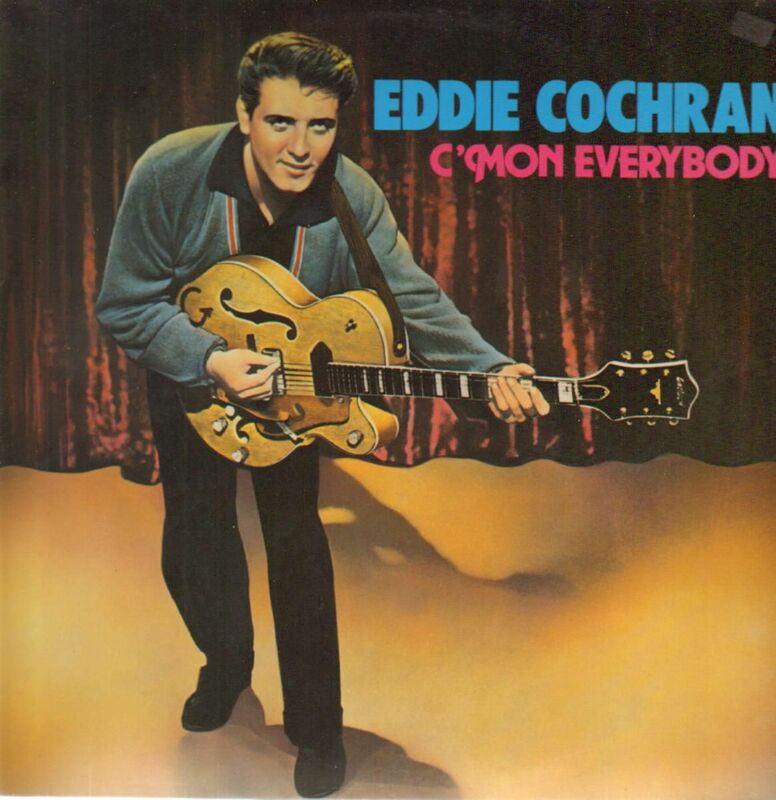 At number 89 in BBC Radio 2’s 100 greatest guitar riffs is “C’mon Everybody” by Eddie Cochran. Here is a video of this song. Enjoy! NASA’s New Horizons space probe has been on its way to Pluto since its launch in January 2006, and NASA has recently announced that it has started its “approach phase”. As part of testing its instruments, and in order to make any final corrections before it flies past Pluto in July, the probe is already taking images even though it is still some 200 million km from Pluto (which is more than the distance from the Earth to the Sun). Pluto, discovered by Clyde Tombaugh in 1930, was listed as one of the nine planets in our Solar System. But, in 2006, the International Astronomical Union (IAU) demoted it to the status of “dwarf planet”; a status it shares with a few other objects like Ceres (the largest object in the asteroid belt between Mars and Jupiter) and Eris, which is in the Kuiper belt. In fact, it was the discovery of objects in the Kuiper belt in the 1990s which led to Pluto being demoted to a dwarf planet status, as it was realised that it just happened to be the largest of the known Kuiper belt objects, and the first to be discovered. Although we have sent space probes to all the other “classical” planets, and in fact to some asteroids, this will be the first time a space probe has visited Pluto. Because of this, we hope to learn a lot more about Pluto as the probe flies past it. Because of the speed of the probe, and the relatively small mass of Pluto, the probe will not be able to go into orbit about Pluto, but instead will pass about 14,000 km from its surface (roughly the same as the diameter of the Earth). As it whizzes by the various instruments will make their measurements, and they will only get one chance at it. 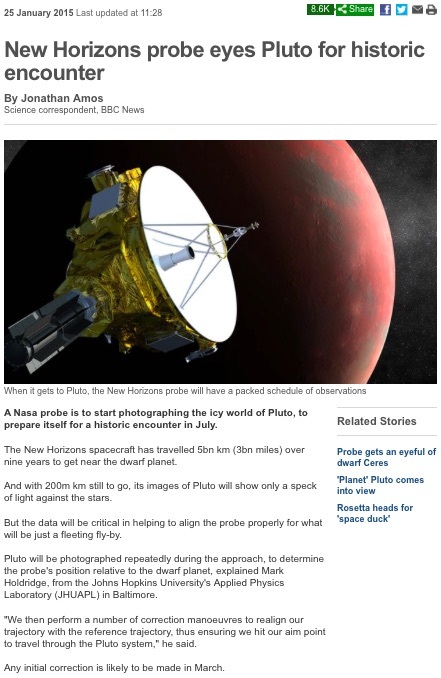 NASA’s New Horizons space probe has been travelling towards a July 2015 fly-by of Pluto since January 2006. It was discovered in 1978 that Pluto had a satellite, Charon, the discovery being made from ground-based telescope images of Pluto. Since then, four other satellites have been discovered; Nix and Hydra were discovered in 2006, Kerberos in 2011 and Styx in 2012. So, as things stand, we now know of five moons orbiting Pluto, although New Horizons may discover more. We also hope to learn more about Pluto and Charon’s surface features, their composition, and whether Charon has an atmosphere. I will write future blogs on this as NASA releases these results. 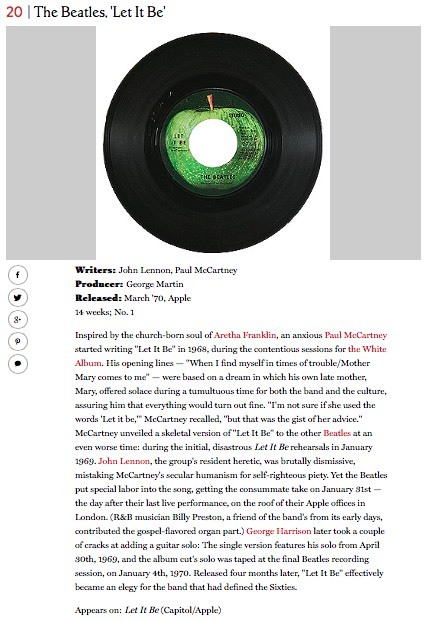 At number 20 in Rolling Stone Magazine’s 500 greatest songs of all time is “Let it Be” by The Beatles. This song is one of the great Paul McCartney songs, with a wonderfully plaintive piano and fantastic lyrics which are both personal and universal. Over the years, it has become one of the most recognised Beatles songs, and McCartney played it as his contribution to the London part of Live Aid in 1985. At number 20 in Rolling Stone Magazine’s ‘500 Greatest Songs of all Time’ is “Let it Be” by The Beatles. Here is a video of this beautiful song, taken from the “Let it Be” movie. Enjoy! Yesterday (Monday the 26th) I was on the BBC talking about Asteroid 2004 BL86, a fairly large asteroid which has just flown by us. It was at its closest to us at about 16:10 GMT/UT, and was expected to be just over 3 times further away than the Moon when at its closest. Thankfully it missed us, because such a large asteroid would cause wide-spread devastation were it to hit the Earth. As the name of the asteroid implies, it was discovered in 2004 by a programme known as LINEAR, the Lincoln Near Earth Asteroid Research, named after the Lincoln laboratory at MIT, who are one of the partners along with NASA and the US Air Force. 2004 BL86 is estimated to be between 400 metres and 1km in size, considerably larger than the asteroid which exploded above Chelyabinsk in southern Russia in February 2013. That asteroid has been estimated to have been about 17 metres in size, and injured about 1,000 people in a sparsely populated part of Russia when it exploded in the atmosphere. Just imagine the devastation a 400m+ asteroid would cause, with a mass over twenty times larger its energy would also be over twenty times more (assuming the same speed)! An artist’s impression of Asteroid 2004 BL86 passing the Earth. The orbital parameters of asteroid 2004 BL86 have been sufficiently well determined that we know that it will almost certainly never hit the Earth. The only way in which it could would be if its orbit were somehow significantly altered, but this is unlikely given its large size as it is much harder to change the direction of a large asteroid than a smaller one. It will not visit the Earth’s vicinity again for over 200 years, and in fact it is the largest known asteroid to come this close to us until asteroid 1999 AN10 passes us in 2027. 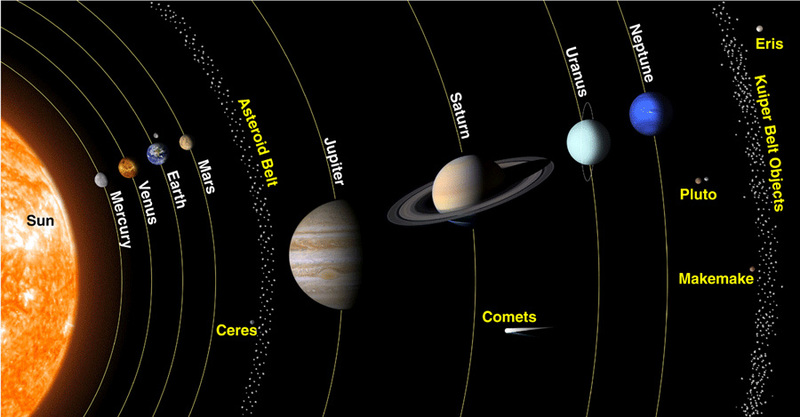 Most asteroids are found in the asteroid belt, which lies between the orbit of Mars and Jupiter. They are thought to be the small building blocks of the planets, but which were prevented from coalescing to form a planet because of Jupiter’s gravitational disruption. The asteroid belt lies between the orbits of Mars and Jupiter. Further out is the Kuiper belt, the reservoir of short-period comets. However, there are other asteroids which are not in the main asteroid belt, and some of these have orbits which bring them close to Earth. Every now and again we get hit by one, but thankfully it is very very rare for Earth to be bit by a large asteroid. Although the statistics are very sparse, we think that something the size of the Chelyabinsk asteroid hits the Earth about once a century, and something the size of 2004 BL86 hitting the Earth would be much rarer, maybe once every few tens of thousands of years. Unfortunately, this asteroid is not bright enough to be visible to the naked eye, but it is visible through a small telescope or large binoculars. 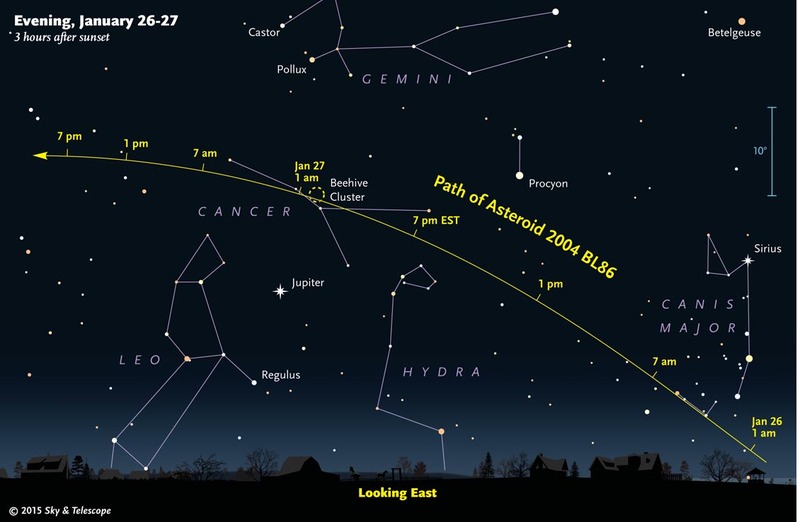 It will be about 9th magnitude at its brightest, and the chart below, taken from Sky & Telescope magazine, shows its path through the sky against the background stars. Note: the times on this chart are Eastern Standard Time, so add 5 hours for GMT/UT. At the time of its closest approach to Earth it was in the constellation Hydra, and could be seen about mid-way between Jupiter and Sirius. Just before midnight GMT/UT on the 26th it passed into Cancer, and passed close to the Beehive Cluster at about 6am GMT/UT earlier this morning. Where to find asteroid 2004 BL86 in the sky over the nights of the 26th and 27th of January.